maProject Vilnius 2009: educational exchange - weEk 02 - who are we? educational exchange - weEk 02 - who are we? How do I play my instrument ? How do I play my body? How do we communicate with each other with sound and movement? The second week brought dancers and musicians to an open dialog and educational exchange. Improvisation of sounds, voices and movement was the tool to introduce the language of each participant. Each musician presented his instrument. The studio was filled in with sounds of drums, accordion, clarinet, vibraphone, double bass, guitar and three charming voices of Bulgarian singers. The dancers got a feeling of sounds, its dimension and amplitude. The musicians had a chance (for some of them for the first time) to relate to the movements and communicate to the bodies in motion. All practice was moderated in different combination of solos, duets or trios in the interaction with instrument to embody the colours of the sounds, exploring the instrument. How the mirroring, continuing or opposing works in relation to the sound and instrument? Where can you stretch the relationship which you establish with the musician? Sound and movement. What is the sound of movement? Dancers had a task to accompany their movement with the sounds using voice or body rhythms and opposite the sound was translated into the motion. Next task was to bring and interact the sounds from outside (city sounds) with the body and express inside voices out. 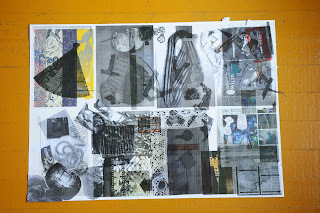 The collages from the workshops with Joost turned into the linear maps, which were used further to explore and practice the movement composition. With extra layer of qualities, referring to natural structures (going through oil - thin; through the mad - thick, through the pile of stones - broken, and through electric wire - shivering) they got extra qualities and essence. In the same week musicians, using another space, could try to create and practise transparent sounds, low tones, one pitch sound, one common rhythm, braking it down and coming back to it from one note. Friday we all came together for jam session. The idea was to try different intruments with created dance phrases, which was the first moment of composition for the maProject. The second week left good vibe of exchange, getting to know each other and finding out the direction of the coming process. It was the first time when we shared our passion and skills.